Building confidence has never been my strong suit, and I most likely say it more often than necessary. 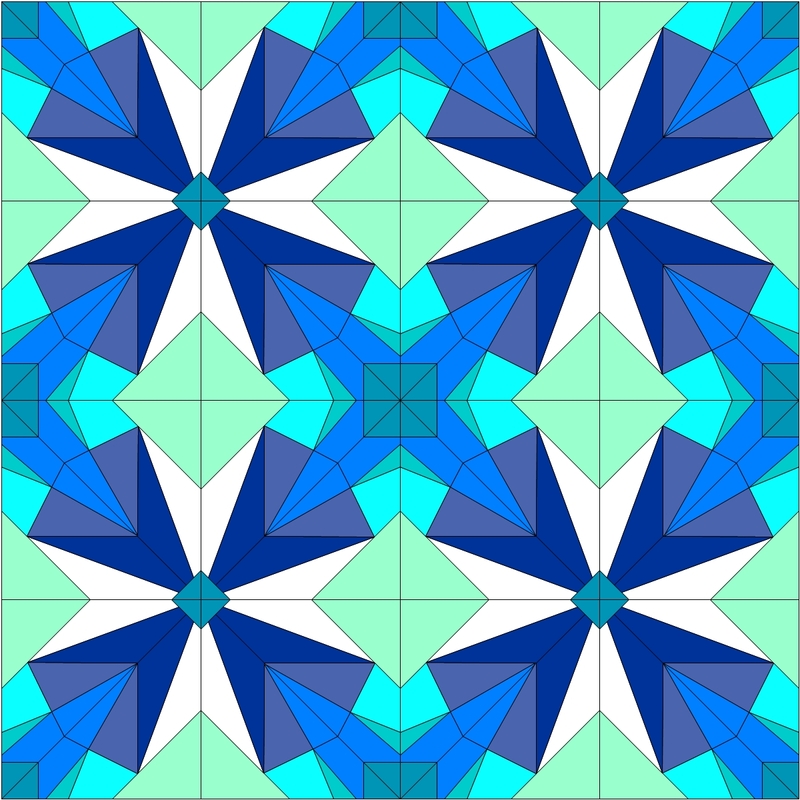 Writing a pattern for a block or a quilt is a scary venture filled with trepidation. Even so, I'm putting myself on the line! It might even feel like a firing squad! Pretty dramatic don't you think?! Foundation paper piecing (FPP) has become one of my favorite techniques. 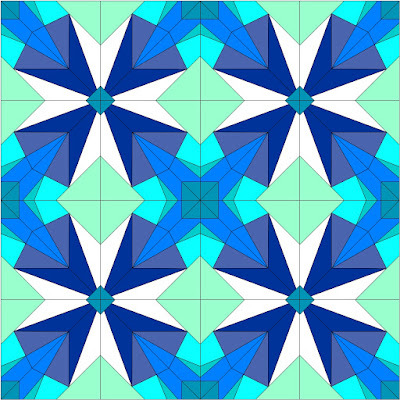 As my love for FPP increased, so did my curiosity and desire to design my own blocks and quilts. ‘Atomic Bloom’ is one of those blocks! After refining the design, I settled on what I think is a fun and unique block. It reminds me of the inside of a flower with a funky twist, while others see rocket ships, mushrooms, popsicles or fireworks! A bonus with this block is the ease in which you can go scrappy. With each block made up of four (4) sections, you can easily make each block unique and all your own! 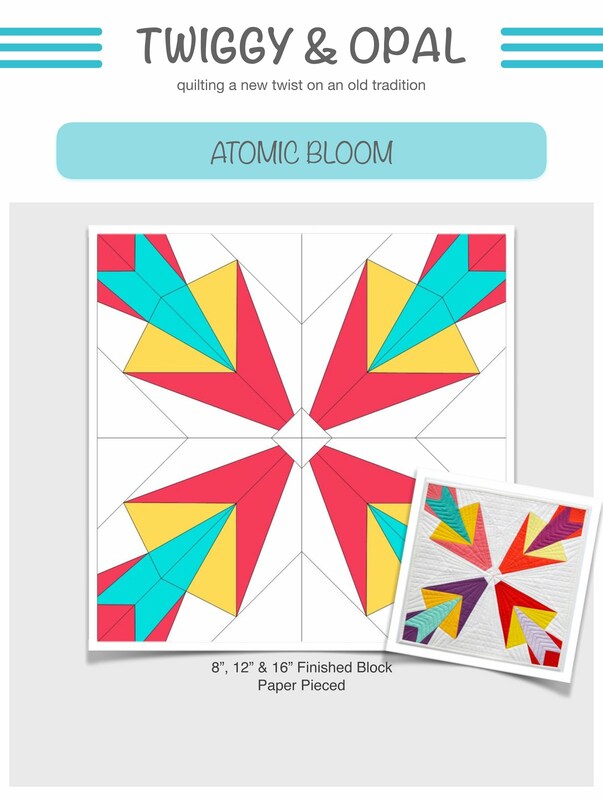 This drama girl is officially announcing the release of 'Atomic Bloom', a paper pieced block available in three (3) sizes. There are templates for 8", 12" and 16" blocks. 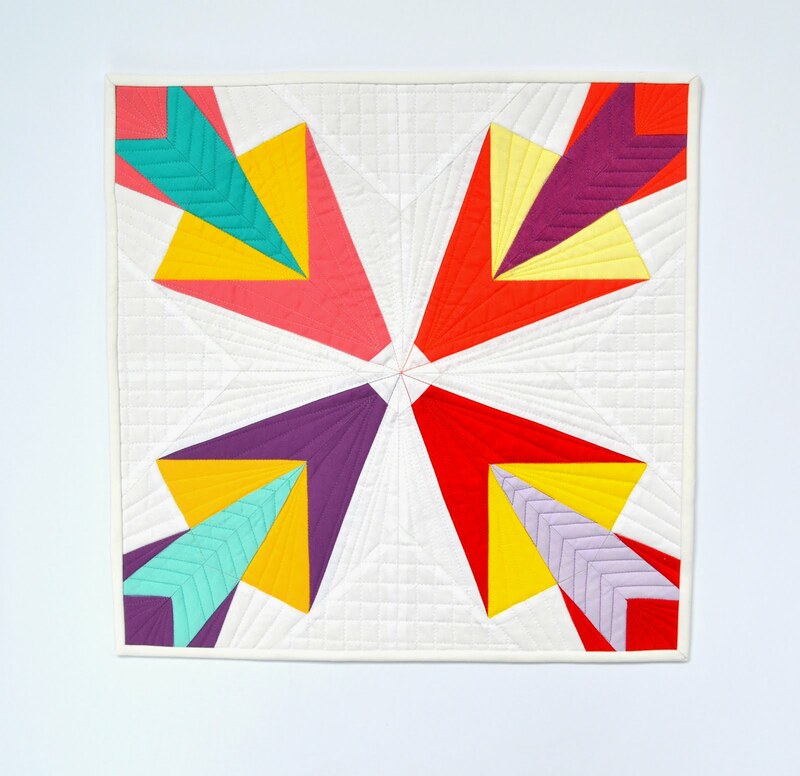 'Atomic Bloom' is now available for purchase in my Craftsy Shop! You have your 8" block, this mini quilt was featured on Friday in the Patriotic Blog Hop. Red, White & Blue...Patriotic...I'm feeling the celebration! This 16" mini quilt was the one that started this whole pattern thingy! The original 'Atomic Bloom'. This is a semi scrappy quilt, but I could see taking it at least another step further. When designing a block, you sometimes get an unexpected surprise with secondary designs. This is pretty color combination... the 'cool' zone! Adding a border or sashing surprisingly changed everything about the block. Or it could also be the unusual color palette too! I may have to try this layout and color combination...wheels are turning! Thank you for letting me 'toot' my horn! I always feel like I need a vacation or a therapy session after completing a pattern! Does it ever get easier?! As a reminder, you can still enter my giveaway for a Patriotic fat quarter bundle of Painter's Palette Solids! 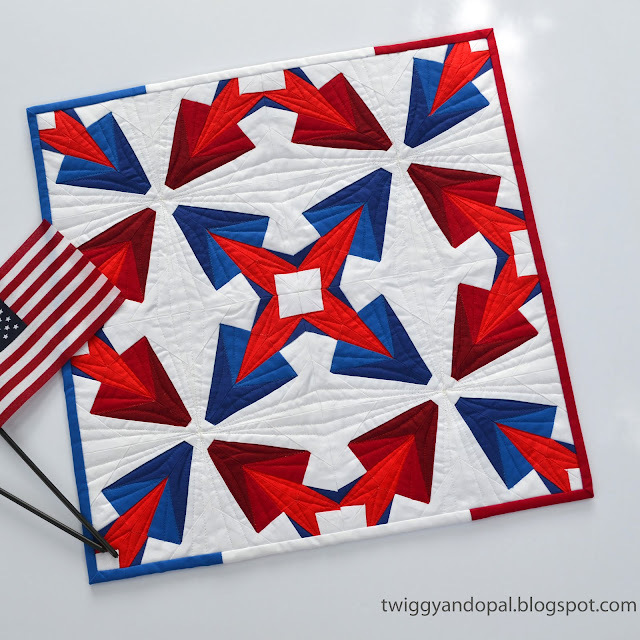 Just click here to leave a comment: Patriotic Palette Blog Hop & Giveaway!! Congrats Jayne, on your pattern release! I just love it in the patriotic colors! The block really makes an interesting design! I had fun putting the red, white and blue one together! Congrats on your pattern release!!! I LOVE this block. So many great angles means lots of dot to dot quilting fun. And best of all, it would look great in so many different color combinations. I really struggle with writing patterns, and only hope this will make it easier for the next one! I’m excited to make a big quilt with the block one day! Congrats on the pattern release! I just love it! And all of the different ways to change it up are amazing. I especially like it with the sashing. Great job! Wow...awesome pattern. Congratulations! I hope your confidence continues to grow -- you have great ideas. 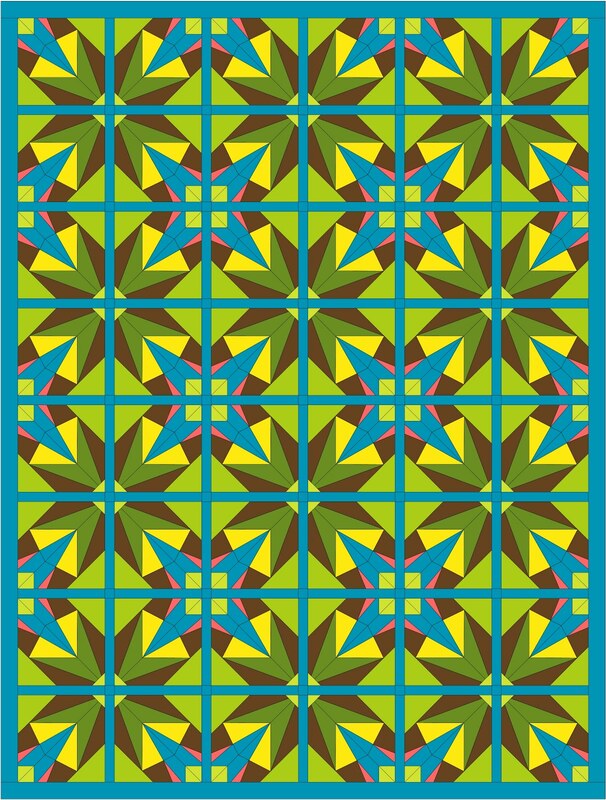 Great pattern, Jayne! I have medallions on my mind today so I think it would make a great central motif - keeping it as an idea! Hope it does well for you. VERY cool block! Thanks for sharing all the neat color combos...it really helps me visualize what I could do with it. What a great block Jane!! I love it. The effects of the different colors and with or without sashing is really wonderful. Congrats to you for pushing yourself in an area where you are not confident. That is such a challenge. I get the flower look but honestly, with the patriotic one, I do see those popsicles we had as a kid. So summery!! 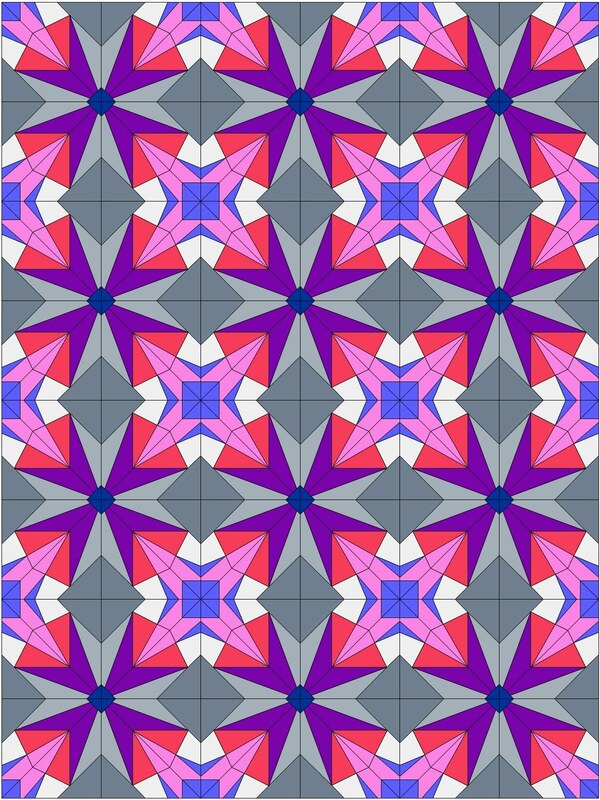 Congratulations on your pattern, you are such a talented quilter and a great designer too. It couldn't happen to a nicer person. (I'm coming late to the party...but) this block is AWESOME! Congratulations.